Wraps have saved many arrows out in the woods, but how could that be? If you're in to saving money, you don't want to lose arrows every time you go hunting. So many archers love the bright colored wraps. Wraps help the archer find his lost arrows. Wraps definitely make it easier to find those elusive arrows who snuggle up in a bunch of weeds or nestle down in a bunch of tall grass. 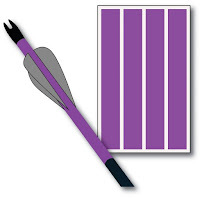 Some archers just like to add a bit of color on their arrows and others use wraps just to help them locate lost arrows. Yet there are a few archers out there who don't like bright colored wraps, they'd rather lose arrows then wrap their arrows with bright colored wraps. Each to his own, but if this is your first year to go hunting, I'd bet that you'd be might happy wrapping your arrows with bright colored wraps. Features: 2 sizes, great selection of colors and very easy application sized to reduce overlap. 12 wraps per package.